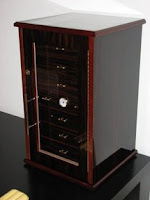 Finally, here is something about the Adorini Chianti Grande humidor. Anyway, first of all, the appearanace of this "mini cabinet" by Adorini is beautiful. Warm colors of mahogany coated with multiple sheets of laquer create a sophisticated and luxurious feeling about the humidor. In addition to the good looks, this humidor also works well. It has a capacity of 300 cigars officially, but as you know, it varies with the size and shape of cigars you store in it. The Chianti Grande has a full cedar lining, a set of seven cedary trays to hold the cigars, two large oasis-sponge humidifiers as a default and a hygrometer visible without opening the humidor (thanks for the glass door). The Chianti Grande humidor is airtight and holds a constant RH% throughout the whole humidor. This is thank to decent humidifiers (upgrade if you do not see the sponges sufficient), the slots in the trays, that allow air to flow freely and the 6cm deep space between the back of the trays and the back of the humidor (in which the humidifiers are, and which distributes the humidity and air throughout the humidor). The only fault worth mentioning in Chianti Grande is the door. When you want to get to your cigars, you have to open the door entirely. As the door is hinged to the inner side of the opening to ensure an air tight seal, it has to be opened enough to get the trays out. So, this humidor needs at least a little bit of space around it. This is not a problem, but if you have a limited space available, it might be an issue. Another thing is the lock: although i do not need to lock my humidor and probably most of you do not either, it would be great to have at least a decent locking mechanism on your humidor. Now the lock and the key seem to fall apart instantly as you first touch them. Do not get me wrong, they work as far as i need them, but if you need to keep your cigars behind locks, you might want to consider a chain and a padlock for this one. All in all, the Adorini Chianti Grande is worth buying if you need a larger humidor, but not a cabinet. I myself, will have to buy me a decent cabinet next. Even the Chianti Grande is not enough for my singles collection anymore. I would recommend to purchase the Adorini Chianti Grande from HumidorDiscount.com. That is where i got it (thank you guys!). The price is affordable 269 EUR (411 USD) , service is great and delivery in the EU is free of charge, to the US 13 USD and very affordable world wide. Go for it!